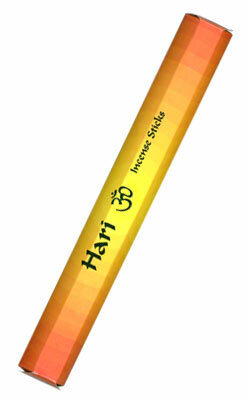 "Om the Divine Boundless Truth has captured my Heart"
"Hari OM" is a Kamini Incense from their highest, premium quality Masala range. A deep, heart-opening fragrance to aid you in contemplace, meditation and peace. "Masala" is an Indian word denoting a blend of spices and herbs such as those used in preparing curries and other delicacies. The preparation of a masala incense stick begins in a similar by grinding together various natural aromatic substances (flowers, roots, resins, herbs and spices) into a paste. The paste (known as a "dhoop") is then rolled onto a bamboo stick. Masalas usually do not contain liquid prefumes and thus the fragrance is more natural and last much longer. Very popular in Australia, New Zealand and throughout Europe, Kamini incense has only recently been introduced to the American market. It is imported from India and made according to ages-old hand rolled traditional methods.